In this article we have explained how to use Excel SUMIF Formula. Excel SUMIF function can be used to sum the value in a range that meets the given criteria. range is the argument that specifies the cells in which the criteria or the condition is to be checked. We should select the range of cells in the formula. criteria is the condition to be checked, which can be text, number, cell reference, formula etc. The criteria with text, logical or mathematical symbol should be enclosed in double quotation marks (“). 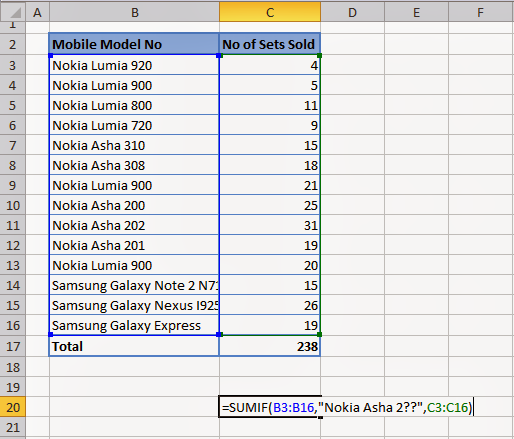 sum_range is the range of cells which you want to add based on the given criteria. This is not the compulsory argument. If you do not give the sum_range it will consider the range as the sum_range. In the following example if you want to add all the numbers more than 20 you can use the following argument. In this formula the range and sum_range are same. 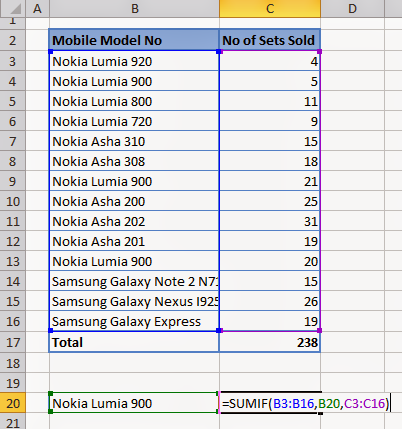 In the following example if you want total number of Nokia Lumia 900 sets sold, you can use the following argument with Excel SUMIF formula. In the following argument the criteria can be a cell reference or text in the formula. Alternatively you can also use the following formula. You can also use wild card characters question mark (?) and asterisk (*) in the criteria of Excel SUMIF formula. A question mark (?) matches only single character; an asterisk (*) matches any sequence of characters. 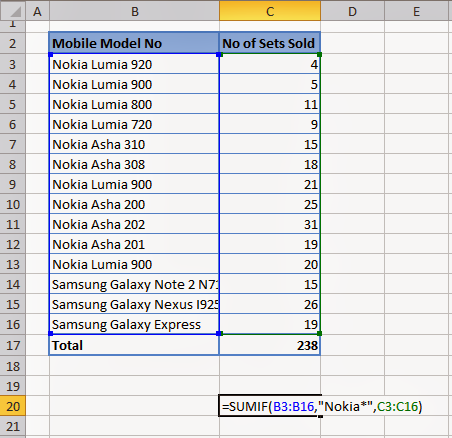 In the same given example if you want to add the Number of Nokia mobile sets sold, you can get this by using (*) in the criteria. 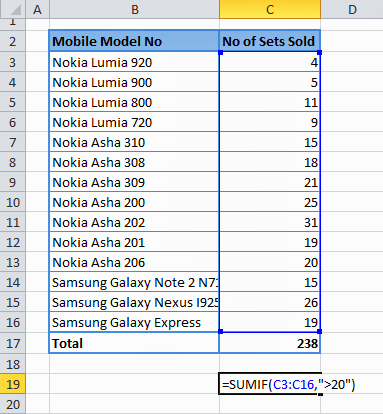 Further, if you want to add number of sets sold for Nokia Asha 200 series, then you can use (?) in the criteria of Excel SUMIF formula. SUMIF is very much helpful in filtering or getting summary information in large amount of data. If you have any question or query on this please comment. You may also like SUMIFS Functions in Excel. Great guide for excel, thank you. I use it in conjunction with another one about excel sumif (mostly for the video, since your guide is a little more detailed). Hope i could help someone with this.